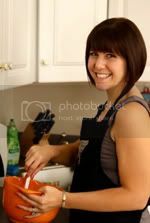 When you decide you want to start writing a cooking blog, everyone comes out of the woodwork to offer their ideas, recipes and tips. I love it. Keep them coming! My biggest supporter of all time, Mom, contributed this recipe to my healthy eating cause. Anytime she sends me a healthy recipe with the disclaimer, “Your stepdad even liked it,” I take notice. This is the man who would spread bacon grease on his toast without a second thought if that were acceptable behavior. Taste is king in that house! If you can sneak in a healthy recipe that fools him, it’s worth a try. I was overjoyed that the snow was so heavy in New York this week that I got to take a day off from work. I just don’t understand the appeal of snow. It’s cold and wet. You can’t do much in it except throw yourself down a mountain with two little strips of fiberglass strapped clumsily to your feet. I’m no wimp, it just baffles me. I’m made for sun and sand, not cold and wet. So, a snow day for me means curling up in my jammies and watching movies on the couch all day. 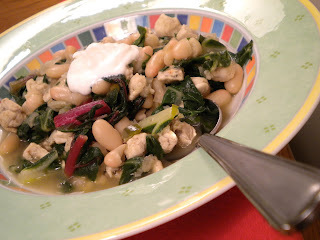 I decided the chilly weather was the perfect setting to try this Cannellini Beany White Chili. That’s a silly little name I gave it because I happen to like when things rhyme. I’ve never had a white chili before and I was a little skeptical. Dicing up chicken breast was a nice texture difference from the typical ground meat. The swiss chard added a little crunch. I was surprised at how much this tasted like chili without the addition of any tomato or chili powder. It was a perfectly satisfying winter meal without being too heavy. I liked topping it with sour cream. Basically because I’m Hungarian and we like our sour cream! You could omit it to save the calories if you like. Interesting little factoid, Swiss Chard contains a ton of vitamins including Vitamin A and K. It also pumps up the fiber in this dish which is essential for feeling full while dropping a few pesky pounds. Thumbs up Mom! I love cannellini beans, and this sounds excellent. Can't wait to try it out!